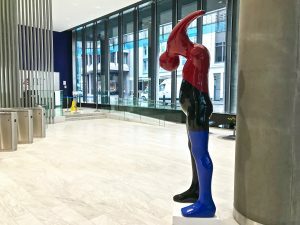 We are proud to be exhibiting four sculptures by Sam Shendi called ‘Moving Forward’ ‘Awkward’ ‘Falling into the Past” and ‘Hammer Head’ Part the Only Human Collection his thought process based on phrases we use in conversation that have shaped the form of these vessels. Born in Egypt, Sam Shendi studied Monumental and Architectural Sculpture at the University of Helwan in Cairo. After receiving his degree in 1997, he opened his own Interior Design office. In 2000, he moved from Egypt to the UK. Since then, he has exhibited throughout the UK and Europe. Sam takes the human figure to its simplest form enabling the exploration of the idea of the human form as a vessel. So by reducing the human body to a container or minimal shape, his creations become centred on an emotion or an expression. The simplicity is no longer the end result and devoid of meaning but a revelation of a hidden truth and intellectual expression. Some of his works are deceptively simple in form but include the qualities of metaphorical associations, symbolism and suggestions of spiritual transcendence, which is what the artist of the 60’s and 70’s were trying to avoid. The colour in this collection describes the emotion hidden within the piece and is a completion of the actual concept. 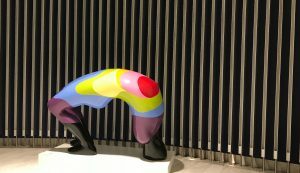 Each sculpture is formed as a human figure whilst simultaneously acting like a canvas which if stretched out would give you an abstract colourful painting, showing that emotion has a colourful impact on human energy and action. In the present time, human beings are no longer a subject of focus on a daily basis and have become devalued. Our emotions are so powerful, if we look back at the past mankind uses this emotion to direct not just thousands but millions. These pieces are a frozen body movement which has been shaped by the emotion to allow you to understand that each one of them is only a presentation of who you are. Each form also contains geometric shapes producing the outline of symbols and mathematical functions. Sam has worldwide recognition and collectors and was the winner of theFIRST@108 Public Art Award 2013. All pieces sculptures are available to purchase. For any information about them contact info@artful.org.uk l 0208 702 8030. 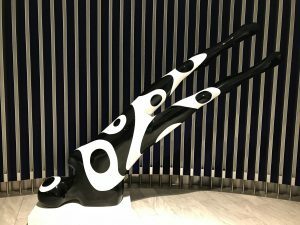 Sculptures will be on display until 03.09.2018.